The story of the 'Winter War' between Finland and Soviet Russia is a dramatic David versus Goliath encounter. When close to half a million Soviet troops poured into Finland in 1939 it was expected that Finnish defences would collapse in a matter of weeks. But they held firm. The Finns not only survived the initial attacks but succeeded in inflicting devastating casualties before superior Russian numbers eventually forced a peace settlement. This is a rigorously detailed and utterly compelling guide to Finland's vital, but almost forgotten role in the cataclysmic World War II. It reveals the untold story of iron determination, unparalleled skill and utter mastery of winter warfare that characterized Finland's fight for survival on the hellish Eastern Front. 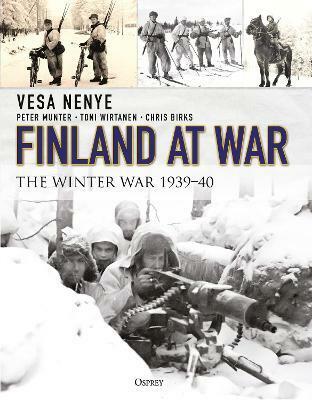 Finland at War: the Winter War 1939-40 is the premiere English-language history of the fighting performance of the Finns, drawing on first-hand accounts and previously unpublished photographs to explain just how they were able to perform military feats that nearly defy belief. After graduating college, Vesa Nenye followed his family's illustrious military tradition and served his country, Finland, as a Tank Commander and an Arms & Munitions NCO. Upon leaving the armed forces, he became a member of the Panssarikilta - the armoured core heritage society in Finland. A veteran of historical and strategy gaming in Finland, Peter Munter founded a play-by-mail business in the times before internet and worked extensively as writer and translator of roleplaying supplements in the late 80s. Peter is an ex-Marine from the Finnish Navy and currently works as a Managing Director in a games retail chain that he established with Vesa Nenye in 1997. After graduating from high school with the highest grades, Toni Wirtanen served in the Kymi Jager Battalion of the Karelian Brigade, as an infantry anti-tank specialist. He was discharged with honours as a lance corporal, and has ever since been active with the reservist corps. Toni is best known for his work as the singer and songwriter in the rock band Apulanta, founded in 1991. Chris Birks moved from England to Bergen, Norway, at the age of 13. He went on to study geology at the University of Bergen. Whilst studying, he developed a keen interest in military history and was instrumental in the development of the hobby scene for strategy wargaming in Norway. Chris now works as a teacher of mathematics and natural sciences, and splits his free time between family trips to the mountains, wargaming and different historical research projects.